Karin Hobbs doubled down and it paid off at the 2014 IFBB Golden State Championships held in Sacramento, California. Karin won not only the open Pro Women’s Physique competition but also the Master’s Pro Women’s Physique competition. The Boise resident was the unanimous winner on the scorecards and has a spot in the Olympia showdown next month in Vegas. Coming in second was Jillian Reville. Jillian returned to the stage for the first time since having heart surgery last year. Rounding out the top three was Colorado’s Heather Grace. Heather edged out Akane Nigro-Ismeal by one point. Finishing in fifth was Jennifer Robinson. Robinson is already qualified for the Olympia but will need to come in sharper if she has hopes for being a contender in the stacked Olympia lineup. The results were pretty much the same in the Masters with Karin taking the unanimous victory. William Bonac took home the victory in the Men’s competition and earned a spot in the Olympia lineup with the win. Each month, NPC President Jim Manion selects the Athletes of the Month in each of the organizationâ€™s seven divisions â€“ Menâ€™s and Womenâ€™s Bodybuilding, Figure, Bikini, Fitness and Menâ€™s and Womenâ€™s Physique â€“ based on in-person analysis and on the information provided by contest promoters across the country and featured in the NPC News Online Contest Roundups. PITTSBURGH, PENNSYLVANIA (January 30, 2013) – The National Physique Committee and Gaspari Nutrition have named Michael VanLeeuwen, Rene Marven, Corinna Booth, Maura Bouchard, Gerald Pressley, Ginger Martin and Kristine Duba Athletes of the Month for the month of October. – Menâ€™s Bodybuilding: Michael VanLeeuwen, 32, competed in his first NPC contest as a teenager in 1999. After a 10-year break, VanLeeuwen returned to the stage this year and won two Overall titles in October at the Dexter Jackson Memphis Classic and the Music City Championships. – Womenâ€™s Bodybuilding: Rene Marven, 26, won the Middleweight division and Overall at the New York Grand Prix, giving her three straight class wins in her first three NPC contests dating back to 2011. In November, Marven kept that streak alive by winning her class and a pro card at the NPC Nationals. – Figure: Former military police officer Corinna Booth won her class and the Overall at the Ft. Lauderdale Championships. Booth, a single mother and full-time nursing student, also won her pro card this past November at the NPC Nationals. – Bikini: Brazilian-born Maura Bouchard won her class and the Overall at the Ft. Lauderdale Championships. Bouchard, 25, won Overall titles in four of her six NPC contests since she started competing in 2011. – Menâ€™s Physique: Gerald Pressley, 32, ran track and field at the University of South Carolina and was an All-American on the Gamecocks 4×400 meter relay team in 2001. Pressley won his class and the Overall at the Texas State Championships in his second Menâ€™s Physique competition. – Womenâ€™s Physique: Ginger Martinâ€™s NPC career started in 2004, and the 43-year-old mother of three competed in both Figure and Womenâ€™s Bodybuilding before finally finding a home in the Womenâ€™s Physique division last year. In October, Martin won her class and the Overall at the Texas State Championships. – Fitness: Kristine Duba, 26, took a four-year break from fitness competitions, but returned with a vengeance this year by winning three Overall tittles in two contests, including the Fitness and Figure Overall at the Washington State Championships in October. Mark Wahlberg and Dwayne Johnson star in the newest Michael Bay film schedule to hit theaters on April 26, 2013. The story is based on a true story of two bodybuilders in Florida who get caught up in an extortion ring and kidnapping scheme that goes terribly wrong. Director Michael Bay is known for his over-the-top big budget films but Bay and the bodybuilding Bad Boys reportedly all took pay cuts for this film. 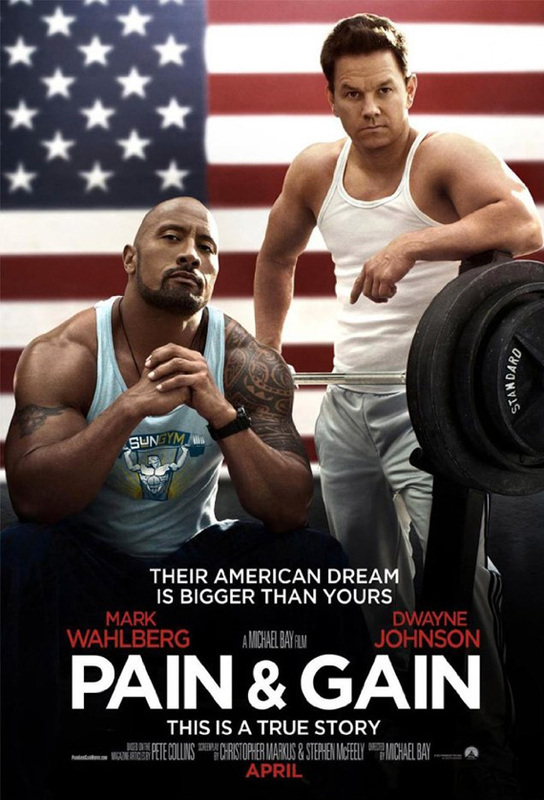 Mark Wahlberg bulked up for his role in order to hang with “The Rock” in this film. Both men are in solid shape and look hardbody, at least from this trailer. The Rock recently tweeted, “AM: Shot craziest scenes of my career. PM: Pray for forgiveness. AM: Do it all over again. #PainAndGain”. Pain & Gain Trailer from Michael Bay Dot Com on Vimeo. What will the world think of a bodybuilding movie when it’s released this Spring? Only time will tell but let’s hope it inspires more people to get off the couch and hit the gym. Stay updated with the movie on twitter, facebook and the official website. The 2013 IFBB Pro League Contest schedule has been released and there are a few new shows added, as well as a couple new locations. The Fitness and Women’s Bodybuilding divisions will see fewer shows in the United States in 2013. The schedule is subject to change and your best bet is to visit IFBBpro.com for the latest contest information. The breakdown of shows from 2012 to 2013 are below. The biggest hit was the Fitness Division with 4 few shows on the schedule for 2013. Women’s Bodybuilding loses a show, while Women’s Physique is down two shows overall from the 2012 schedule. Figure and Bikini continue to dominate and both divisions are up in total shows from 2012. For a complete list of the men’s events visit IFBBpro.com. IFBB Bikini Pro Jaime Baird continues to refine her physique and has positioned herself as one of the leading ladies in the division. She will be heading to the Olympia once again this month and as with most competitors plans on bringing her best look to date. Bodybuilding.com caught up with the always professional Jaime for an interview where she talks about a busy schedule, staying focused and more. Judging by your professional resume, you appear to juggle many interests at once. How do you balance your competitive aspirations with other important areas of your life? It can definitely be a challenge. However, I feel that fitness has made me more effective in all areas of my life. I like to say: “Fitness fuels life success.” That said, time and energy are limited resources. For me, making good use of the early morning hours is a key to fitting it all in. I accomplish so much between the hours of 5-and-9 a.m. (there are fewer demands on my time early in the morning). Also, I’ve had to become extremely scheduledâ€”accounting for every minute in a day. If I want to add something, I must delete something. So, I’ve had to become comfortable with saying “no” and prioritizing. Although to be honest, I still struggle with both from time to time. Sigh. Please send any tips and tricks my way. Bodybuilding.com‘s David Robinson caught up with 2010 Bikini Olympia champion Sonia Gonzales. Sonia is heading to her third Olympia in hopes for repeating her 2010 finish. She dropped to 5th at last year’s show however has two wins under her heels this year, including the Bikini International. Sonia tells Robinson she’s been working on her glutes and bringing in a rounder booty to the show. I pray and I know God has put me in this event for a reason; it’s all his plan and that’s truly what I believe. It’s not an accident that I’m there. I believe it’s truly a gift from God. I am going to bring my best shape ever. Let the best woman win. It’s God’s plan, and he will put me where he thinks I need to be!